This trip involved targeted meetings with key research and industry personnel to consolidate the existing relationship and secure ongoing research support for two Seafood CRC student projects as well as to advance the research agendas developed as part of those projects and establish ongoing international research partnerships. 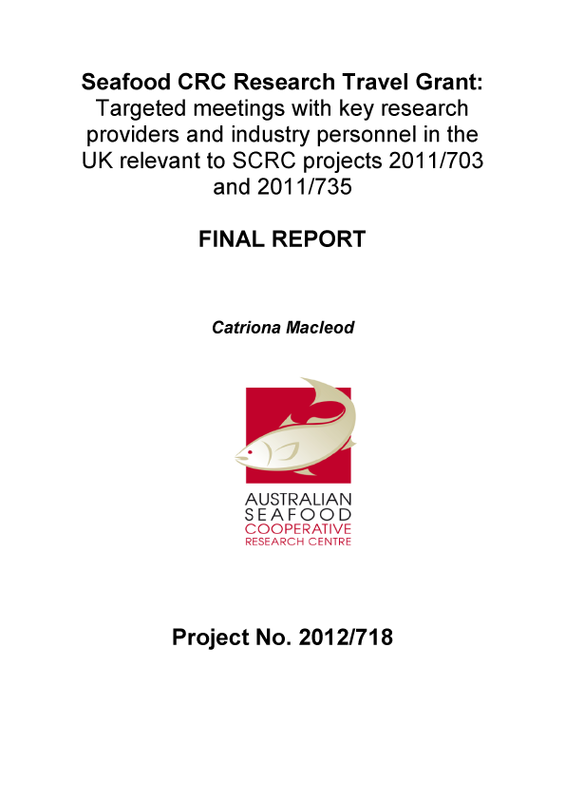 These projects included “An evaluation of the options for expansion of salmonid aquaculture in Tasmanian waters”, and “Tracking methyl mercury contamination pathways in key commercially and recreationally fished species”. The travel grant supported meetings with researchers and industry in the UK, including representatives from the University of Plymouth, Marine Institute at the University of Plymouth, Marine Harvest International and the University of St Andrews. This trip has achieved all of the outcomes anticipated - confirming the commitment to the research area and consolidating and expanding the ongoing analytical support of PS Analytical. In addition, discussions with Plymouth University proposed ongoing communication to explore opportunities to collaborate in international research efforts associated with mercury bioaccumulation in marine and coastal systems. The first of these collaborations has been initiated with the submission of a multi-institutional research collaboration involving PS Analytical.